Cypress Bend is a gated community in Bossier City, Louisiana. Homes come standard with long list of great features and homeowners have many floor plans to choose from. 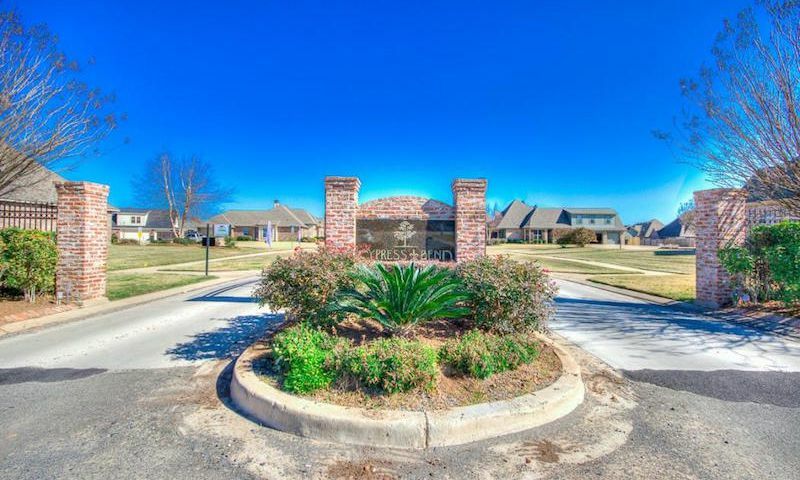 Located near golf courses, outdoor recreation, and the city of Shreveport, residents of this community are a short drive away from any of their favorite pastimes. A homeowners’ association (HOA) takes care of exterior maintenance in the community, so residents have more time to enjoy all that Northern Louisiana has to offer. Residents of Cypress Bend can take a stroll through the community’s walking paths and meet their neighbors for a picnic at the scenic pond. Thanks to the HOA helping out with lawn care, garbage pickup, and common area maintenance, homeowners have more time to socialize with friends or enjoy their hobbies. DSLD Homes began construction at Cypress Bend in 2009 and plans to build 316 homes. These single-family homes range in size from 1,642 to 2,610 square feet and have three or four bedrooms, two to three bathrooms, and an attached two-car garage. Homes are built with radiant barrier roof decking and energy-efficient appliances. Interior features include slab granite countertops in kitchen and bathrooms, wood flooring in living area and halls, and raised panel birch cabinets throughout. Exterior features include an insulated garage door, patio or covered porch, and flood lights. Cypress Bend is conveniently located near shopping and dining on the Louisiana Boardwalk and Airline Drive. Golfers have several options to choose from in the area, including Northwood Hills Country Club and The Golf Club at Stonebridge. Also nearby is Cypress Black Bayou, a full-service recreation area with swimming, camping, cabins for rent, fishing piers, and a zoo. With quick access to LA-3, residents can easily commute into Shreveport or Barksdale Air Force Base. Cypress Bend in Bossier City, LA is a highly sought-after community thanks to its quality homes and a location that’s both quiet and convenient. Check back soon for more information on the lifestyle in Cypress Bend. DSLD Homes began construction at Cypress Bend in 2009 and plans to build 316 homes. These single-family homes rang in size from 1,642 to 2,610 square feet and have three or four bedrooms, two or three bathrooms, and an attached two-car garage. Homes are built with radiant barrier roof decking and energy efficient appliances. Interior features include slab granite countertops in kitchen and bathrooms, wood flooring in living areas and halls, and raised panel birch cabinets throughout. Exterior features include an insulated garage door, patio or covered porch, and flood lights. DSLD Homes began construction at Cypress Bend in 2009 and plans to build 316 homes. These single-family homes range in size from 1,856 to 2,610 square feet and have two to three bedrooms, two or three bathrooms, and an attached two-car garage. Homes are built with radiant barrier roof decking and energy-efficient appliances. Interior features include slab granite countertops in kitchens and bathrooms, wood flooring in living areas and halls, and raised panel birch cabinets throughout. Exterior features include an insulated garage door, patio or covered porch, and flood lights. 55places.com is not affiliated with the developer(s) or homeowners association of Cypress Bend. The information you submit is distributed to a 55places.com Partner Agent, who is a licensed real estate agent. The information regarding Cypress Bend has not been verified or approved by the developer or homeowners association. Please verify all information prior to purchasing. 55places.com is not responsible for any errors regarding the information displayed on this website.